The various types of people with personality disorders prey in different manners and with different motivations--though since there is cross-over between the personality disorders there will also be cross-over in actions and motives. The borderline wants a relationship, believes in love, and believes that the MLCer is her true and destined soul mate. The narcissist simply needs to draw attention to validate existence--the attention may come from an adulterous spouse or from dramatic anger of a betrayed spouse. The histrionic needs the attention derived from a physical relationship to validate her existence. Once she receives validation she dumps'em, if her target moves on she renews her interest. The antisocial doesn't want a relationship; she will use the MLCer for her own pleasures and discard him when he no longer serves her purposes; she will not beg, plead or cling unless such actions are a calculated ploy from which she derives a cat-playing-with-the-mouse pleasure. 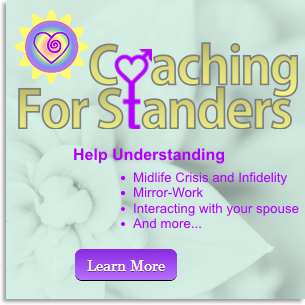 Infidelity is not always about creating a relationship with the alienator, among others it includes one-night stands as well as clandestine affairs with a lifer alienator who accepts the lower-status position and agrees to maintain secrecy. Though their search may include one-night stands, flings or secret affairs, MLCers are seeking a bonded relationship; they are seeking someone with whom they can escape and build a new fantasy life. They want to validate their relationship by making it public and earning approval for it. Narcissists and antisocial are not interested in emotionally bonded relationships. Their motivation in relating is to validate their existence and superiority. Though they need other people for comparison against themselves and to fulfill their need for attention, they do not fear abandonment because their will always be someone else. A relationship with a narcissist or antisocial will last only as long as they are interested or receiving some benefit and not a moment longer. MLCers who date narcissists or antisocial may have multiple affairs in their search for someone who desires an emotionally bonded relationship. Of the Cluster B disorders, the borderline and histrionic seem most receptive to a relationship with an MLCer since histrionics and borderlines are oriented toward relationships, whereas narcissists and antisocials lack the capability. MLCers and both histrionics and borderlines have a need for the thrill provided by in-fatuation and romanticize relationships with fantasy expectations. An MLCer in a relationship with a narcissist or antisocial is more likely caught in a delicate web of deceit. A person with a personality disorder is a master faker and the MLCer is unaware that everything is a façade. MLCers want to rescue and histrionics and borderlines wants to be rescued. MLCers are often seeking to validate their worth not only as a person but also sexually, they feel old and unattractive and the interest of a new person helps them to feel young and vital again. In the beginning this need for validation may cause an MLCer to interpret the partner's fear of abandonment behaviours as signs of true love. To an MLCer the borderline and histrionics' dramatic displays are evidence that he is worthy and she loves him. It is an ego-boost to be desired by two or more women--wife and alienator. If the alienator fakes or secretly plans a pregnancy or threatens suicide his friends may label her as psycho, but he will rationalize her motivations as being so in-love with him that she had to do something to show him and ensure he would not leave or that he would come back had he already left. Behaviour that would send most people running is both frightening and yet enticing to an MLCer who is desperate for evidence that he is worthy of being loved. The partner of a person with a personality disorder regularly deals with a variety of random moods and behaviours such as rapid mood swings, dangerous impulsivity and high risk behaviour, rage and possibly physical violence. Imagine a romantic relationship with a partner whose emotions are erratic and whose opinion of you swings between polar opposites overnight. The spouse of some MLCers may imagine such a scenario with ease. But in most cases, such behaviours are new to an MLCer--within 12-24 months prior to Bomb Drop. Imagine these symptoms as permanent characteristics. One day you arrive home to discover your belongings on the lawn. The next day your partner is begging you to come back or threatening you not to leave--threatening you physically or to harm himself, or uses guilt, you owe him for all he has done for you or he cannot survive without you. In circumstances of a break-up, the a person with a personality disorder may enlist unsuspecting friends and family with false information in a personal vendetta to make your life miserable if that person feels you have destroyed their reputation. Inconsistency is the only consistency. Maintaining and surviving a relationship with someone who has a personality disorder requires a person with a strong sense of Self and boundaries; MLCers are not such people. The partner of the person with a personality disorder is susceptible to mental breakdowns of their own from the psychological stress; depression and self-devaluation are significant risks and a person may eventually doubt his own sanity and begin to believe the negative accusations of his partner. An MLCer is already susceptible; dealing with a person with a personality disorder exacerbates a midlife crisis.